Women with early-stage breast cancer that has spread to their lymph nodes may require less extensive surgery than previously thought, according to a new study. TUESDAY, February 8 (Health.com) — Women with early-stage breast cancer that has spread to their lymph nodes may require less extensive surgery than previously thought, according to a new study in the Journal of the American Medical Association. For years, doctors have tested whether breast cancer has infiltrated a woman's lymph nodes by injecting a dye into the tumor and identifying the nodes where the dye appears. If these so-called sentinel nodes don’t contain cancer cells, doctors assume that the lymph nodes farther away from the breast are cancer-free too. If, on the other hand, the sentinel nodes are found to contain cancer after being removed and dissected, a patient typically goes on to have most or all of the lymph nodes in her armpit area removed. That additional surgery appears to be unnecessary in some cases, the study suggests. Women in the study who had only their sentinel nodes removed had the same survival rate and were just as likely to be cancer-free at five years as women who underwent the second round of surgery. "It looks like you may not have to do the more radical operation," says the lead researcher, Armando Giuliano, MD, the director of the John Wayne Cancer Institute Breast Center at Saint John's Health Center, in Santa Monica, Calif. Dr. Giuliano pioneered the use of the sentinel-node technique in breast cancer patients in the early 1990s. "The more dissection and work you've done in the axilla, [the] more postoperative discomfort," says David Pearlstone, MD, the chief of breast surgery at Hackensack University Medical Center, in Hackensack, N.J. "Many women will go on to have a long-term issue with this arm." Five years after surgery, roughly 92% of the women in both groups were still alive. Slightly fewer women who underwent axillary node removal were cancer-free (82%) compared to those who had only their sentinel nodes removed (84%), but the difference was not statistically significant. As expected, women who received the more extensive surgery were more likely to experience swelling, tingling or numbness, and other complications. The removal of axillary nodes may be less critical now thanks to advances in the diagnosis and treatment of breast cancer, the researchers say. Breast cancers are detected earlier, fewer women develop cancerous lymph nodes, and more effective chemotherapy and radiation help prevent cancer cells from spreading, Dr. Giuliano says. However, some breast cancer patients will continue to need the more extensive lymph node removal, depending on the type and severity of their cancer. 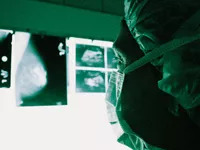 For instance, the authors note that the procedure "remains standard practice" in women who have had a mastectomy or who receive partial (as opposed to whole-breast) radiation—two groups that were excluded from the study. "I wouldn't be too quick to apply this information to women who don't have the exact situation," Dr. Giuliano says. While some oncologists may be reluctant to change their practice, he adds, the findings should spur doctors to "reexamine" the use of axillary dissection in breast cancer patients similar to those in the study. The study "gives us a lot of comfort now to go ahead and not do a full node dissection in these women," Dr. Pearlstone says. "To be able to avoid that now is going to be a very, very big advantage for these patients."